“Location Check in is so 2010,” Mark Cuban writes today on his blog. His thought is that facial recognition hardware/software installed in public venues is going to replace the need for users to actually check-in to a place. I absolutely agree. But I think we’re ten years away from that happening. And maybe more. If you’ve seen the Steven Spielberg movie Minority Report, it has a similar technology to what Cuban envisions. 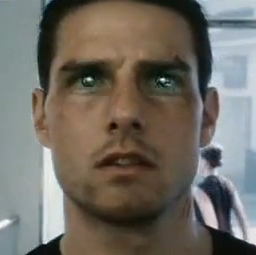 At a few points, main character John Anderton (Tom Cruise) is walking through a public place and a retina scanner picks up his unique eye signature and offers up customized advertisements and specials for him. “John Anderton, you could use a Guinness right about now!” American Express recognizes that Anderton has been a card member since 2037. Even more in line with Cuban’s vision is when Anderton (now with another person’s set of eyes — long story) walks into the Gap and the eye scan allows the virtual greeter to ask how the last purchase he made has been treating him. To most people, this will sound extremely creepy and invasive. To me (and I suspect Cuban), this sounds fantastic. It sounds like the future we’re inevitably headed toward. But it is still the future. Minority Report takes place in 2054. Sure, that’s just a random date picked out by the filmmakers, but Spielberg actually hired a team of consultants — so-called futurists — to come up with technology that is likely to be in place all those years from now. They’re trying to be as realistic as possible. Yes, the retina scanning in the movie is more advanced than the facial recognition stuff Cuban is talking about. But I’d argue that it’s not really a matter of technology advancement that will hinder such things. Instead, it’s society being ready for these new forms of technology. Think about the location space right now. Foursquare, the current company getting most of the buzz, is hardly the first player in the space. Not even close. But they came along at the right time with the right method. When Foursquare launched in 2009, it was actually co-founder Dennis Crowley’s second location-based service. The first was the similar Dodgeball, which was purchased by Google in 2005, but never really took off. Part of the reason is that application development on smartphones was basically non-existent before 2008 when Apple’s App Store came along. So Dodgeball was done through SMS. It was clunky. Mainstream adoption would have been very difficult to achieve. I agree that next step is coming. But before we get to facial recognition, things such as background location with geofencing will come into play first. And those are still a little bit away from happening. The fact of the matter is that one of the key reasons Foursquare took off and quickly stole the buzz from services that were earlier in the space like Loopt and Whrrl is because of the check-in. It helped ease users into location because they were in control of it (and the game elements certainly helped as well). Next, users will need an app to ease them into using background location and geofencing (which allows you to be checked-in to places automatically). It could be one of the current players, or it could be someone new. But that concept, which will have to be opt-in by virtue of installing an application, will be needed to pave the way for what Cuban is taking about farther down the line. Cuban sees the future where this facial recognition accesses Facebook’s name/profile picture database to pull information. If you thought Facebook’s current privacy issues are a nightmare, this would be Armageddon. But again, that’s just looking at it right now. Down the line, people will grow more and more accustomed to this type of stuff. And perhaps the scenario Cuban lays out will be the norm. But hopefully posts like Cuban’s which bring up the topic and dream of the future will help get us there quicker.